Lizzie and Evie are such best friends, that when they were younger, they passed as twins. They talked alike, wore their hair alike, dressed alike, moved alike, and just about breathed in sync. They were the type of friends that changed in front of each other without batting an eye and could have complete conversations with each other without uttering a single syllable. The two were inseperable, and weren’t known so much as two individuals, but as a two-headed duo, Lizzie and Evie, or Evie and Lizzie. And then something happened that changed the course of events for the rest of their lives; Evie disappeared in broad daylight. Becoming the center of attention in her sleepy town as the last person to see Evie alive, Lizzie goes on a rampage, sneaking through backyards and homes at night, ransacking the lives of her quiet suburban neighborhood, and searching for clues as to where her best friend has gone. What she finds is that nothing is as it seems, not Evie’s family and life, not her neighbors, not even Lizzie’s own family. The truth she uncovers is that growing up to be a woman, even in suburbia, will never be easy. There’s a great debate going on in the literary world that the neo-noir scene is for men, by men, about men, and no girls are allowed. However, there is a short list of women that can be and should be recommended by everyone with similar writing styles and talents. Megan Abbott is by far, one of those women that need to be raised up. Her voice, her writing is as solid and engaging as the leading men. I’ll be honest, I have a difficult time getting into books by women, or about women. I don’t know how to explain it, or what the reason is, I just don’t. There are a few women on my bookshelf, and one in particular that I’d recommend without batting an eye in Wendy Dale, but outside of such a short list, there’s very little interest. That is until someone I highly respected recommended Ms. Abbott’s work. Being the sheep that I am, I e-wandered over to Amazon and purchased her latest release. And after a selection or two, I found myself in a world of dark secrets and intrigue, just as engaging and entertaining, if not more so, than some of the bigger hitters in the literary boy’s club. Her writing is simply as solid as it gets, and she builds these characters and this world that are so incredibly real, that you feel them. You feel the hairs on the back of your neck when they enter the room. You smell their shampoo after they’ve gone. And you miss them at the end of everything. 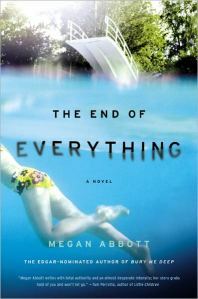 This entry was posted in Reviews and tagged Megan Abbott, Reagan Arthur Books, The End of Everything, Wendy Dale. Bookmark the permalink.